CLASS LEADING CAPABILITY & TECHNOLOGY – Full-LED multi-function headlight and intuitive single button cruise control are fitted as standard, along with a host of rider-focused-technology, including Road and Rain Riding Modes, switchable traction control, torque-assist clutch, ABS, immobiliser and a feature packed stylish single clock. 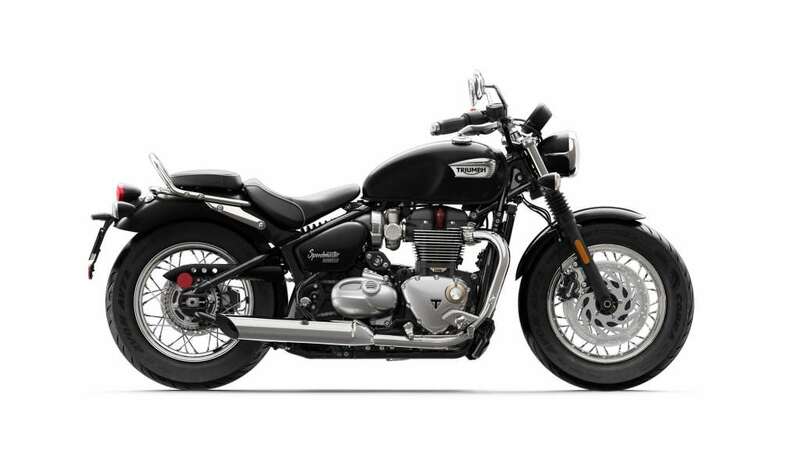 Perfect for riders looking for greater touring capability and a more laid-back cruiser style than the Bonneville T120, the new Speedmaster’s comfortable yet versatile twin seat set-up offers increased practicality together with all the Bonneville Bobber’s attitude. The critically acclaimed high-torque engine, with its powerful hot rod ride and raw sound, has a reassuringly high first major service interval of 10,000 mile / 16,000km. 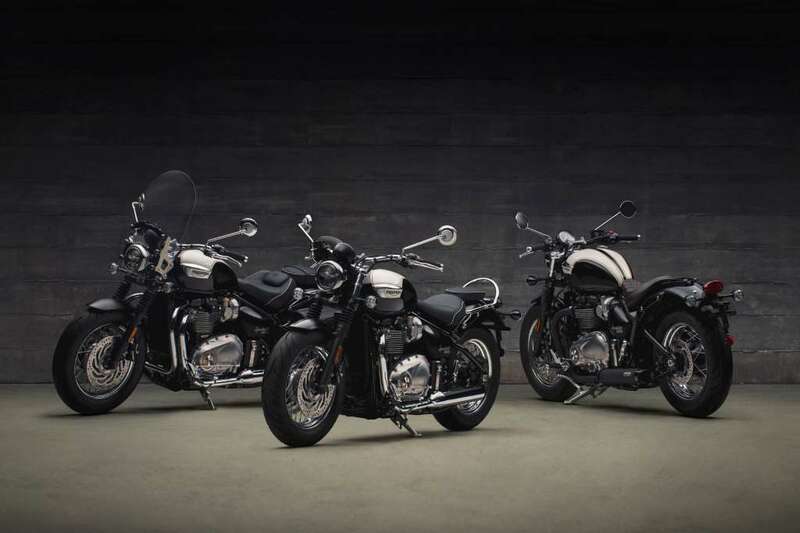 With the introduction of the new Bonneville generation, and specifically the Bonneville T120 and Bonneville Bobber, the range of choice for riders has never been better. The new Bonneville Speedmaster builds on the authentic Triumph classic custom heritage with all of the classic DNA from the Bonneville family and the Bobber’s unique attitude, but now more practical and versatile than ever. The new Speedmaster brings another dimension – a Bonneville with more classic British custom laid back style and an even higher level of specification. •Versatile twin and single seat set ups. •A distinctive ‘cage’ swinging arm for an authentic hard-tail look. •A feature-packed elegant single clock. •Accessories for style, detailing, comfort, touring, and premium Vance & Hines exhausts (market specific). **Availability of Vance & Hines exhausts is governed by local market legislation – please check with your Triumph market representative for availability. The Maverick kit gives the Speedmaster an even more stripped back, mean attitude with a brown quilted single seat set up, flatter raked out handlebars, black Vance & Hines exhausts** and other blacked out details, including exhaust headers, oil filler cap, and a grab rail removal kit and rear mudguard finisher for a stylish and minimal rear end. Distinctive, authentic and unique ALL NEW BONNEVILLE SPEEDMASTER features a host of original features and touches that complement its classic custom attitude and laid-back style. These include a classic headlight nacelle and swept-back beach bars, forward footpegs, sculpted rear mudguard, 12 litre fuel tank and 32 spoke wire wheels. Enhancing its class leading capability THE ALL NEW BONNEVILLE SPEEDMASTER comes with a versatile twin seat set-up and low rider seat height of 710mm. Both the rider and pillion seats are made of deep foam that’s sculpted for extra comfort and finished with premium contrasting piping. The pillion seat, along with chrome grab rail can be easily removed to create an even more distinctive single seat set-up. THE ALL NEW BONNEVILLE SPEEDMASTER has been designed to deliver all of the Bonneville Bobbers attitude and a host of its beautiful features. These include its elegant hard-tail look, minimal body work, classic ‘drum brake’ inspired rear wheel hub, steel mudguards with centre ridge and authentic battery box with stainless steel strap. Fitted with high specification twin skin chrome silencers THE ALL NEW BONNEVILLE SPEEDMASTER features a host of premium detail touches and an incredibly level of finish. High value badging on the tank, brushed engine covers and special bronze 1200HT badges, along with Triumph’s signature triangular ‘makers mark’ all add to the wealth of premium metal, bright chrome and paint finishes. Bullet indicators compliment the Bonneville Speedmaster’s minimalist styling. The branded locking chrome fuel cap compliments the bikes sculpted tank and adds to the overall premium finish. Elegant swept-back beach bars deliver a natural and comfortable cruiser riding position and a distinctive classic custom style. One of the most distinctive features on the classic Triumphs of the 50’s and 60’s, the elegant headlight nacelle brings an authentic design touch to the Speedmaster’s classic custom style. A chrome dresser rail forms part of the new Bonneville Speedmaster’s classic look and comes complete with a chrome grab rail which can be easily removed when switching from a twin to single seat set-up. 16-inch, classic look 32-spoke wire wheels add authentic styling to the new Bonneville Speedmaster and are fitted with specially developed Avon Cobra tyres. 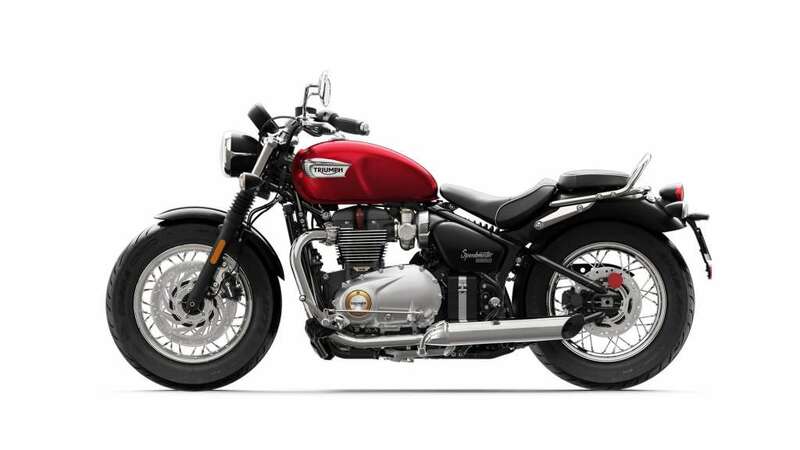 With a 12 litre tank capacity, the new Speedmaster matches the Bonneville T120 on tank size while providing greater touring comfort. Compared to the Bonneville Bobber, the Speedmaster’s larger tank delivers a much longer refuel and riding range. The new Bonneville Speedmaster delivers a unique rich and raw exhaust note that has evolved from the Bonneville T120 but with an even deeper, richer sound. The bright chromed stainless steel exhaust system is twin skinned for a seamless hidden cat box run. Finished with bright chrome silencers it also has a twin chamber airbox and twin filter design. THE ALL NEW BONNEVILLE SPEEDMASTER features the critically acclaimed Bonneville 1200cc HT engine with Triumph’s unmistakable Bobber tune. 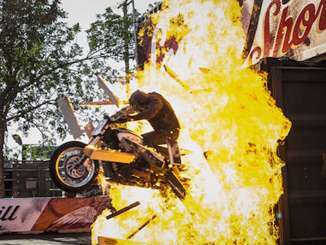 With a category leading torque figure of 106Nm at a low 4,000 rpm – up to 10% more at 4,500 rpm than the Bonneville T120 and an amazing 42% more than the 2015 Speedmaster the new bike has been built to deliver low down and across the rev range when you need it most. 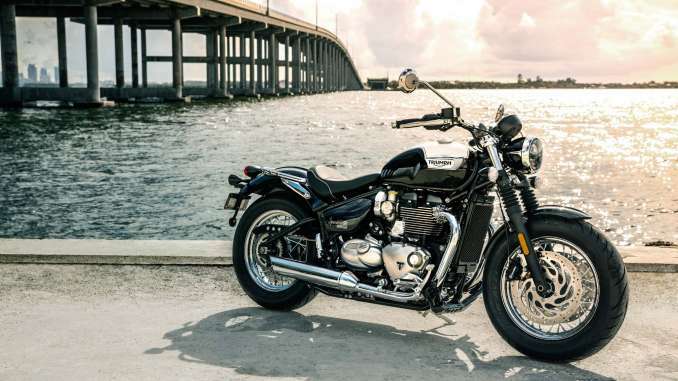 In terms of power the story is the same, with even more, 77Ps at 6,100 rpm, 10% more than the Bonneville T120 at 4,500 rpm and 25% more peak power the 2015 Triumph Speedmaster. The sound is equally as thrilling, with a distinctive rich and raw exhaust note thanks to an innovative twin chamber airbox and twin filter design with signature Bonneville ‘hidden cat box’ header pipe run and unique twin-skin bright chrome exhaust system. Just like the Bonneville Bobber the distinctive ‘cage’ swinging arm provides THE ALL NEW BONNEVILLE SPEEDMASTER with an authentic hard-tail look. Black powder coated and fitted with paddock stand bobbin mounts to aid with bike maintenance. 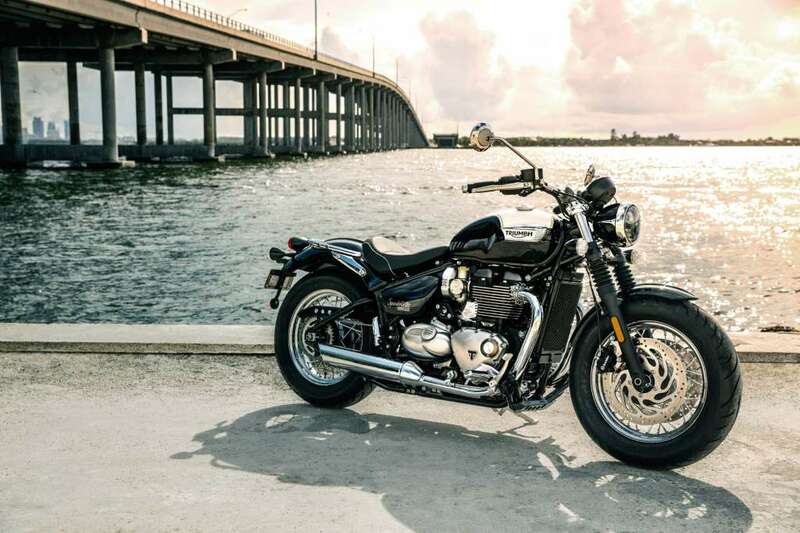 The swept-back beach bars, forward footpegs and low seat height, combined with Triumphs signature neutral handling, deliver a comfortable laid-back cruiser riding position and superior ride. 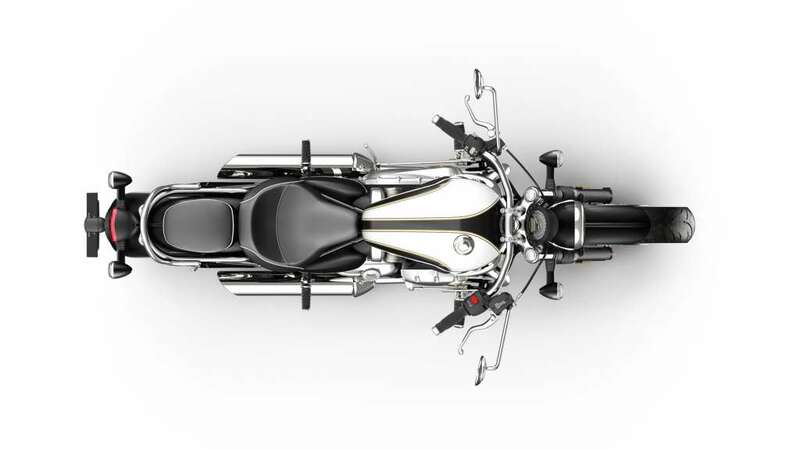 THE ALL NEW BONNEVILLE SPEEMASTER comes with a versatile twin seat set-up and low rider seat height of 710mm. Both the rider and pillion seats are made of deep foam that’s sculpted for extra comfort. The pillion seat, along with chrome grab rail can also be easily removed to create a clean single seat set-up and silhouette. THE ALL NEW BONNEVILLE SPEEDMASTER comes fully equipped with confidence-inspiring high specification brakes and ABS. The front wheel has twin 310mm front discs and twin piston Brembo floating calipers. The rear is fitted with a single 255mm disc with single piston Nissin floating caliper, designed to provide optimal contact and maximise braking force. THE ALL NEW BONNEVILLE SPEEDMASTER has a high specification suspension set-up for a smooth comfortable ride, with 41mm cartridge front forks with 90mm travel. Neatly concealed under the rider seat, the mono-shock rear suspension unit (RSU) with linkage, 73mm rear wheel travel and stepped preload adjuster provides for better wheel control and increased comfort. Thatcham approved, the security device integrates a transponder into THE ALL NEW BONNEVILLE SPEEDMASTER’S premium Triumph badged key. Linked to a receiver that’s located in the ignition barrel, it prevents the engine from starting without the key present. Featuring a high functional, feature packed single clock. The stylish, minimalistic casing neatly houses the LCD multi-function display menu, that can be accessed through easy to reach fingertip controls. Key features include: odometer, rev counter, gear position indicator, range to empty, fuel level, average and current MPG, a clock, two trip settings, service indicator, plus access to cruise control and traction control settings. The parallel twin engine is liquid cooled with a unique radiator and fan, optimising performance and enhancing fuel efficiency, for cleaner reduced emissions that exceed Euro 4 requirements and allow for longer service intervals of 10,000 miles/16,000 kilometres. THE ALL NEW BONNEVILLE SPEEDMASTER features a full-LED 5-inch multi-function headlight with main and dipped beams, along with Triumph’s signature style daytime running light* (DRL) with distinctive light pattern. In addition, the new Speedmaster also has an LED rear light, LED indicators and number plate lights that provide greater power efficiency and durability. * DRL function is only available in applicable markets, and in the US, Canada and Japan the DRL element is illuminated with lower intensity, but is still a recognisable feature. The latest generation ride-by-wire system has been sensitively incorporated to provide enhanced throttle control, ridability and safety. Packed with innovative technologies THE ALL NEW BONNEVILLE SPEEDMASTER incorporates the ABS and switchable traction control. Fully responsive, it adds both safety and confidence in slippery conditions, while remaining compact and unobtrusive to the bikes minimalistic look. THE ALL NEW BONNEVILLE SPEEDMASTER has two selectable Riding Modes – Road and Rain, for greater control and safety. These are selectable through the left-hand switchgear. The torque-assist clutch brings a light touch and feel to the clutch control, reducing lever effort and improving long distance rideability. Helping to reduce rider fatigue, it adds to rider comfort, particularly in urban traffic. A simple and easy to use single-button cruise control system is fitted as standard to the left hand switch gear, to improve long distance comfort and control. Instrument Display and Functions LCD multi-functional instrument pack with analogue speedometer, odometer, gear position indicator, fuel gauge, range to empty indication, service indicator, clock, 2x trip, average & current fuel consumption display, traction control status display, heated grip ready – controlled by a handlebar mounted scroll button. CO2 figures ** EURO 4 Standard: 98 g/km **CO2 and fuel consumption are measured according to regulation 168/2013/EC. Figures on fuel consumption are derived from specific test conditions and are for comparative purposes only. They may not reflect real driving results.